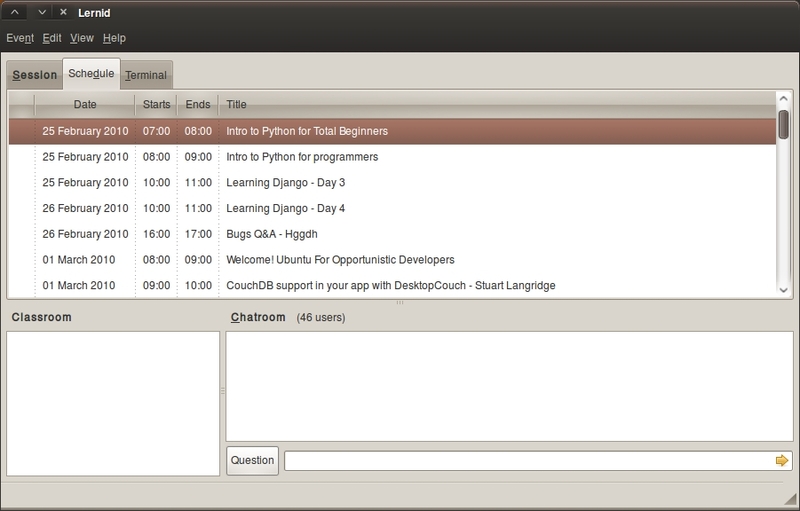 Lernid is a tool that makes connecting to online learning events such as UbuntuOpenWeek and UbuntuDeveloperWeek simple, easy and fun. Lernid gets you immersed in the content quickly and hassle free. * Easy To Get Involved -- connecting to events is simple as running Lernid and entering a nickname. No more trying to figure out the complexities of IRC and how to enter a session. * View Slides In Real Time -- sessions delivered that are optimized for Lernid cna display presentation slides that change as the session leader delivers his/her session. * View Web Pages In Real Time -- if a session leaders wants to show learners a website, the site can be shown automatically in the in-built web browser in Lernid. * Localized Session Times -- no more trying to figure out session times in UTC and converting them to your local timezone. All sessions in the schedule in Lernid are displayed in your local timezone. * Available In Your Language -- Lernid is available in 31 languages and growing! * Session Reminders -- ten minutes before a session and when a session is starting a handy little notification bubble will pop up to remind you of the session. New icon – awesome new icon, and looks smooth as silk in docky too. Nick completion – just like a normal IRC client, type in the first few letters of the nickname, hit tab and boom! there is the nick! Option for show time in class and chatroom – want to see the times? Simple. Possibility for pausing automatic browser updating – don’t like that browser updates? Sorted. NickServ authentication – now you can use your nickserv password when connecting. Question button – want to ask a question in the right format? Click the Question button and then type in your question. Job done. Gwibber support (tweet the ongoing session) – click the Event menu when a session is running and Tweet current session to share your attendance with Twitter/identi.ca/Facebook/FreindFeed etc (only works on Lucid). You can download Lernid for Karmic from the releases PPA. Just click Applications -> Accessories -> Terminal and cut and paste in these commands. Then click Applications -> Internet -> Lernid. If you are running Lucid, Lernid is easier to install than ever as it is now available in Universe! Thanks to the awesome Didier Roche for his work today in getting this into the archive! I would really apreciate it.